Transaction Structure – $100.0MM credit facility; $32.0MM available upon closing; and $68.0MM available upon successful pilot drilling program. January 10, 2007 – ECS was engaged by Barnes Oil and Gas, LLC (“Barnes” or the “Company”) to raise capital to develop the Company’s acreage in the Barnett Shale. March 30, 2007 – The transaction closed with a $100.0MM senior credit facility. Quick Execution – The Company received the capital commitment from the investor less than three months after ECS was engaged. 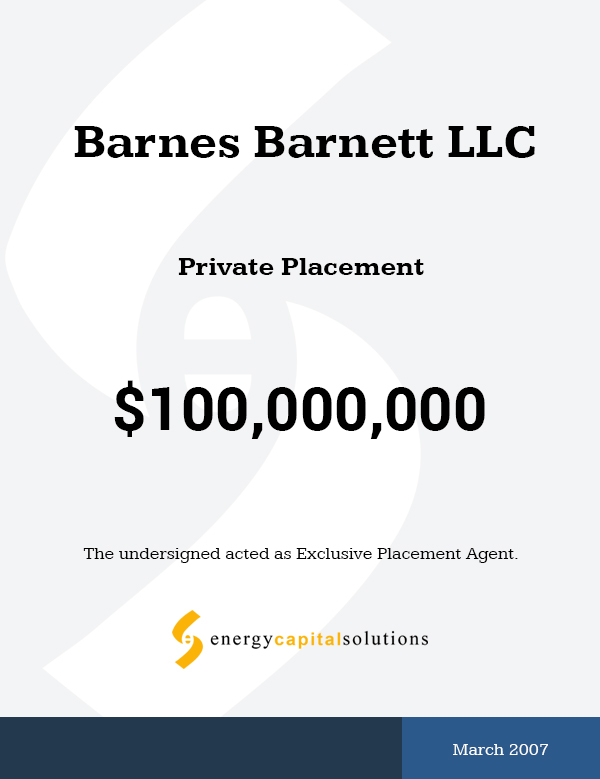 Expanded Transaction – Barnes Oil and Gas was initially seeking capital to develop 10,000 acres. The investor funded most of the Company’s existing 10,000 acres, an additional 10,000 acres and the drilling program for all 20,000 acres.